If you want to enable a grading scheme for a course or specific assignments in the course, you can manage grading schemes for the course. Your institution may have already created grading schemes that you can use in your course, or you can add a new grading scheme. You can also edit and delete grading schemes that you create if necessary. Click the Enable course grading scheme checkbox. Click the view grading scheme link. 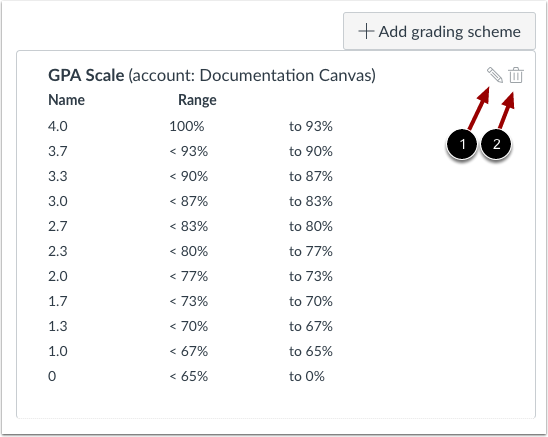 The Grading Schemes page shows all grading schemes for your account or that have been created in your course. If the scheme was created at the account level, the grading scheme includes the name of the account. To add a course grading scheme, click the Add Grading Scheme button. To edit a grading scheme, click the Edit icon . To delete a grading scheme, click the Delete icon . You can only edit or delete grading schemes that you have created for your course. 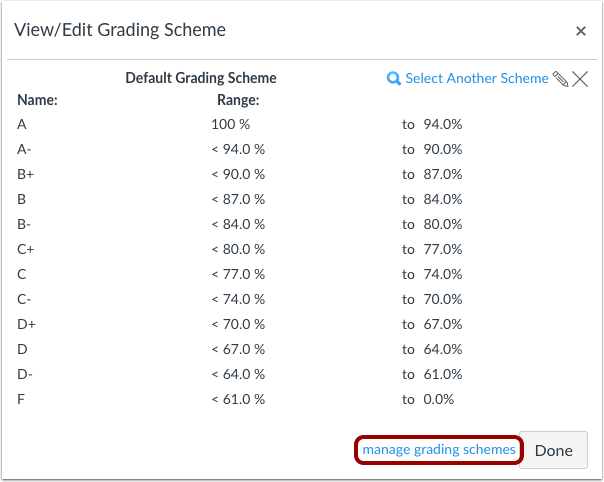 Only users with admin permissions can edit or delete grading schemes created at the account level. 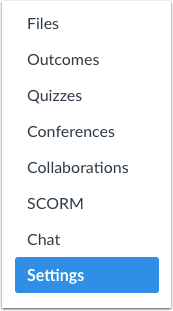 If you do not have permission to manage an account grading scheme, the icons will be grayed out. If you delete a grading scheme that is enabled as the course grading scheme or added to an assignment, the grading scheme will still be retained unless another scheme is selected. Previous Topic:How do I use grading schemes in a course? Next Topic:How do I enable a grading scheme for a course? Table of Contents > Settings > How do I view grading schemes in a course? Re: Why are there two grades under the score column? Re: Settings: "Enable course grading scheme"--What is this? 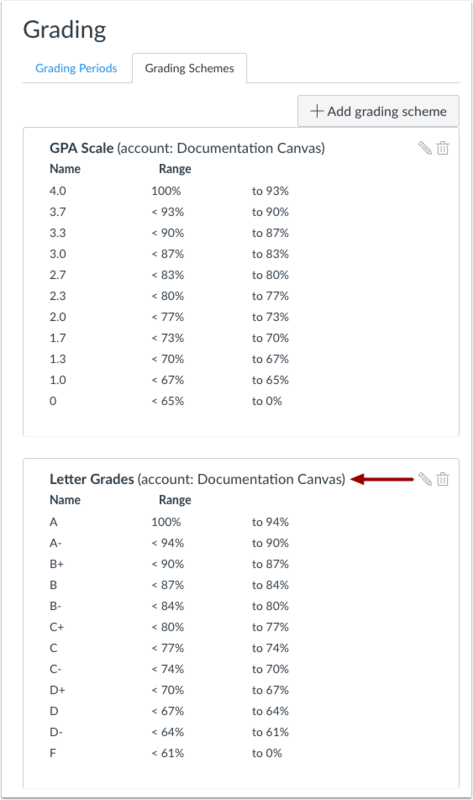 Re: Can you see the letter grade in Canvas?